As sweet as cinnamon: Gifts for others & myself revealed! and enjoying this festive time of year. on a Tuesday... we had a lovely Christmas lunch together and had lots of fun. and also enjoy some very yummy food. 2. A bag I made for my Advent swap partner on the forum. us how to make at our Tuesday craft morning.. I finished this reindeer off and started another for next year..
my darling family, also some beautiful gifts from very dear friends. I will show them in the next post. Did you receive any handmade gifts? Lovely things Dawn! I can see you enjoy Moda's Bakeshop as much as I do! That reindeer is so gorgeous!!! Love all the goodies given and received!! Lovely gifts Dawn. Have a Very Happy New Year!! What a lovely posting full of Christmas treats. It must have been wonderful to receive such beautifully and thoughtfully made gifts. 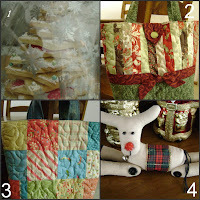 The biscuit tree looks so yummy and the bags are amazing. I absolutely adore the little reindeer and am going to have a go at making one myself. What a nice thinkg to make in your craft class. I was lucky enough to see the gifts before they went to their new owners and the were truly beautiful but I especially liked the bag with the bow on the front and it will be added to my to do list for 2010. see you Tuesday.